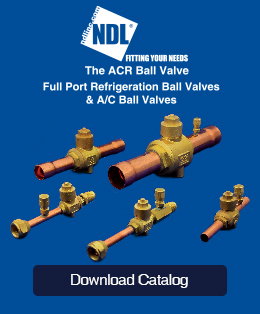 All NDL Ball Valves are FULL PORT, from 1/4″ to 4-1/8″. All Ball Valves are engineered for HVAC/R applications. Each individual Ball Valve is tested for high pressure capabilities before it leaves the factory. NDL poly-bags the Ball Valve for cleanliness during transportation and storage. It is important to the refrigeration system to keep the valves clean; contaminants can cause expensive and destructive malfunctions. The NDL Ball Valves use an innovative internal Teflon seal. Unlike the common use of neoprene as the seal material, NDL Ball Valves will not dry out and leak. Teflon is also used in the Schrader Valve as the built-in seal. The added feature of this technology avoids the risk of over tightening the Schrader valve and causing an expensive leak situation. NDL Ball Valves are packaged with mounting brackets and all necessary hardware inside the box.